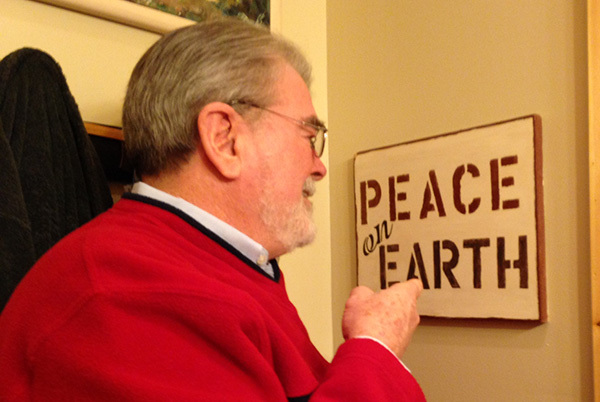 Last year when I was asked, “What do you want for Christmas?”, my constant reply was, “Peace on Earth!” So, I should not have been surprised when my family gave me the words “Peace on Earth”, right? I hung the words in a convenient place where I see them several times each day and offer a prayer. But even a year later, we still see the conflicts on the European borders of Russia, with the Boko Haram in Africa, among Christian-Muslim communities in Kenya, in the midst of religious violence in Indonesia and Somalia, and in economic stress in China, among many other places. So, with the help of Laura Rector, I communicated with several persons, Christian ethicists, who are actually working for peace on earth in some of those places, people who strive for peace in places of conflict and struggle. Their work is described in essays they sent to me and which I have published in Christian Ethics Today, and which I recommend to you. Parush Parushev and Fyodor Raychynets tell of their efforts in Ukraine where the church contends with Russia’s Putin, and Peter Zvagulis describes how Putin’s hate rhetoric divides Christians in Latvia. Elie Haddad and Jesse Wheeler tell about ethical challenges in the Arab Christian world in the Mideast, and Emily J. Choge Ketama gives us insight to Christian-Muslim religious conflict in Kenya. Sunday Boboi Agang describes peacemaking among the Boko Haram in Africa. Paulus Widjaja shares the violent narratives in religious discourse in Indonesia, and Agnes Chiu gives us a solid understanding of employment injustices and class struggles in China. Each of these strong Christians apply the teachings of Jesus regarding peacemaking. They live and work in the places named in headlines, among other serious followers of Jesus in places of great conflict. Somehow the words on my wall come alive when I remember these friends, brothers and sisters.